How to fight cold, flu & allergies to keep yourself well. It’s been a rough flu season. Either you got it, or everyone around you did. Either you were down for the count, or your get-up-and-go just couldn’t. Although the flu season is tapering off, we’re not out of the woods just yet. 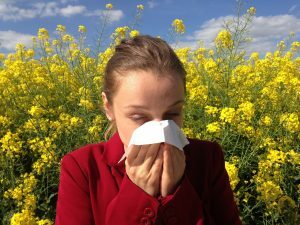 And depending on our unpredictable weather, allergy season may be just around the corner. Where does that leave you? You are either trying to shake off the last of your cold or flu symptoms, trying to stay healthy, and/or preparing for allergy season. Please consider this your one-stop for “why, what and how to get over it”. WHAT YOU CAN DO RIGHT NOW: In the meantime, wear appropriate clothing for unpredictable weather. Pack a hoodie or scarf to keep your neck and shoulders covered. Consider taking off your shoes when entering your home so you don’t carry in dirt, environmental toxins, or allergens. Plan to get a full night’s sleep for more than just one or two nights. Eat your veggies, reduce sugar intake. Move your body. Wash your hands. A link where you can order products I trust, with a 15% discount. 1. WHAT TO DO WHEN YOU’RE FEELING PUNKY: Chinese medicine theory explains that seasonal illness is caused by climate factors, such as Wind, Cold, Heat, Dryness, Damp and Summer-Heat, or combinations thereof. The western model attributes some of these diseases to the power and endurance of the microbe. In either model, it is our immune system that stops the disease progression, either fully or partially. In acupuncture theory, we refer to the immune system under the umbrella of “Defensive Qi” or Wei Qi. 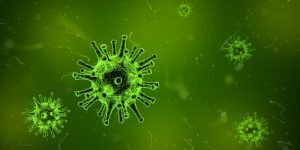 If your Defensive Qi is strong enough, it can push the pathogen back out through the exterior before it can dive deeper into the body (where it can cause more serious illness). You can also take a bath, described below in the Cheat Sheet section. Pollens form a kind of Wind-borne antigen that the body thinks is a foreign invader (infectious disease), so the body mounts a fight. The pollen is not a living organism like a virus or bacteria, so the pollen does not fight to survive. However, there is an increase in immune reaction of both inflammation (fluids, runny eyes, runny nose) and histamine responses, (sneezing, itching, hives). 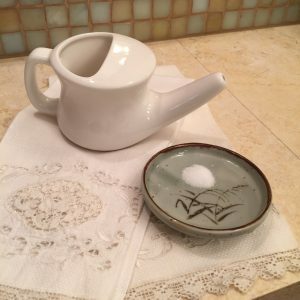 The excess fluids congeal into mucus (nose blowing) and harden into Phlegm (sinus infection, draining into the throat, raw irritated throat, eustachian tube/ear infection). The marsh-like condition of excess fluids becomes the perfect home for opportunistic bacteria, which are otherwise not a problem. Pressure building up in the face can even be mistaken for a tooth infection instead of a sinus or ear infection. Depending on the severity of your illness, you may be able to nip it in the bud yourself. Or you may need to augment your home health kit with a few remedies (labeled as to what they are for so you remember!). Or you may want to come in for a visit to boost your Defensive Qi and for an overall tune-up. As soon as you feel something is off – whatever your early-warning signs are – be ready to act. If you are around sick people, have remedies on hand. If you will be on a train, bus, airplane or in a school, medical center, mall or a large gathering, be prepared. Wash your hands frequently. Get as much rest as possible. Vitamin C with Quercetin* is good for airborne allergy symptoms like pollens, aka “hay fever” as well as a cold or flu virus infection. Zinc lozenges* help give the immune system more force to fight. Immune support such as the Classical Herbal Formula; Yu Ping Feng San*- Jade Windscreen Powder strengthens the immune system, securing the openings of the body from being vulnerable to attack. 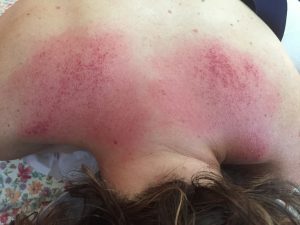 GUA SHA- (see photo above) this firm but gentle scraping called of the neck, shoulders and upper back releases the pathogen from the muscle layer, one of the initial sites of pathogen entry, described earlier. It produces small red dots – petechiae – that disappear after a few days. This is easy to do at home, and most people find it very soothing. Once I was travelling in Lithuania, felt a cold coming on, but had nothing on hand for self-care. However, I used a small plastic shoe horn and moisturizer from my hotel and was very pleased with my make-shift results. I drank a lot of water, went to bed early, and felt fine the next day. Protect your neck. Wind is said to attack the back of the neck and shoulders, so keeping your neck covered with a hoodie or a scarf will protect those vulnerable areas. The acupuncture points located there often have Wind in the name, such as Wind Pool (GB20), Holds Wind (SI12), Shielding Wind (SJ17), and Wind Palace (Du16). Essential oil bath therapy is known for relieving muscle-aches. Take a warm bath with 2 cups Epsom Salts and 40 drops of an essential oil Blend of : Birch, Eucalyptus* (preferably the peppermint variety) , Ravensara* and a dash of Sweet Basil. Or you can keep it simple by using only Ravensara or Eucalyptus. Take something that builds non-specific immune function, such as medicinal mushrooms* or astragalus*. 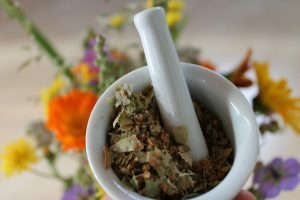 If it couldn’t be stopped and you now have a cold or flu, begin an anti-viral herbal formula to kill the virus. Gui Zhi Tang* can be given to children, and is also for those with chronic illness, autoimmune conditions or general debility. For a strong flu epidemics (Swine Flu, H1N1 strains, or N3N2 strain of 2018), use: Chai Ge Jia Ji Tang, which can be custom-ordered. There are a handful of western remedies and Chinese herbal formulas that specifically handle cough, wheezing and difficulty breathing, sinus infection/congestion, high fever, nausea/vomiting/diarrhea, secondary bacterial infection, and loss of voice. See your herbalist for the right remedy for you. Digestive upset, Patchouli essential oil* rubbed on the belly, surrounding the navel 2-3”. Loss of Voice: Pang Da Hai Powder (see me for a custom order). 4. *Where (and why) to buy trusted products. In addition to the products mentioned in this article, you’ll have access on Wellevate to many other quality professional products and retail brands as well (such as other vitamins, supplements, skin care, protein and vegetable powders, even pet health products). If you like one-stop health shopping, please check it out. By using this link, you will also be able to take advantage of a 15% off retail discount. And lastly, using this link supports my ability to continue to support you. Introducing the collective wisdom and perspective of three women who have been studying and practicing acupuncture and herbal medicine for over 20 years each. Over those decades, we have consumed countless pots of tea as we studied, compared notes, furthered our education and shared cases in our commitment to grow as practitioners and help our patients reclaim their health and vitality.